I have been seeing Dr. Uzelman for almost a year now and have been very impressed with his skill and knowledge and most of all his dedication , enthusiasm and passion for what he does. I have come to understand that the benefits of chiropractic affect our entire body. I came to see if he could help me with my carpal tunnel symptoms and I have had great improvement with that, but also with my neck and back and overall well being. I really appreciate all he has done for me! I want to thank you for being so kind to our family while we were getting our treatments. It was always good to see you on my visits. You were so sweet to me , Robbie and Bobby. Thank you for all the tips you gave me for my acid reflux. I am still using the vinegar. If you have any more hints, let me know. You are so special to us. I appreciate you for caring and helping us. God Bless you and your family. I want to say Thank you for giving me my life back. When I came to you I could hardly walk or move. I was taking Medications every day. Now I can move with ease and I do not take aspirin everyday – I can bend, my feet are better, my knees will bend without pain and my balance is better. I have never been one to drink shakes and take supplements for long periods of time, but I am faithful to my Adrenal Support and NanoGreens because If I don’t I feel the difference. Thank you so much!!! I have had asthma for over 11 years, and have been using an inhaler for at least that long. I was using Albuterol until it was banned from the market. Then I switched to Proventil, needing to use it at times up to four times a day. I had NEVER been to a chiropractor before in my life. I went to Dr Uzelman's office initially for a health and wellness consultation and had no expectations. After my first adjustment I did not use my inhaler AT ALL the next day. Today I notice that I hardly use my inhaler at all, maybe using it one time a day, every other day. Thank you Dr Uzelman for improving my ability to BREATH! After years of searching traditional medicine for help, I tried Premier Family Chiropractic and I can honestly say I have never received so much relief without medication for my chronic migraines, tension headaches, constipation AND restless leg syndrome! Chiropractic care is not just for back pain! My adjustments are very much a part of my self-preservation. What a positive and healthy experience Dr.Uzelman and his staff at Premier Family Chiropractic have been in my life. Thank you,Jen K.
I suffered my back injury June 5, 2000...up to that point, I had always been slender, fit and healthy. Although not athletic really, I'd always been quite active - working out approx. 2 hours/day. My life came to a sudden stand still...and the doctor Ken had gone to for several years said he could help me. I was loyal to him for 3 1/2 years...but I wasn't improving. One of the aspects I so appreciated about you was that you actually listened to me and took action on that input...and I'm finally feeling as though I'm getting my life back. You have helped me with a foot problem I've suffered from for years. You're the first Doctor to get me relief, get me walking again with my husband, and will for ever be grateful. the things you did for me have given me hope of regaining my life...and Ken is equally grateful. As Ken said, "you're the best doctor we've ever been to." 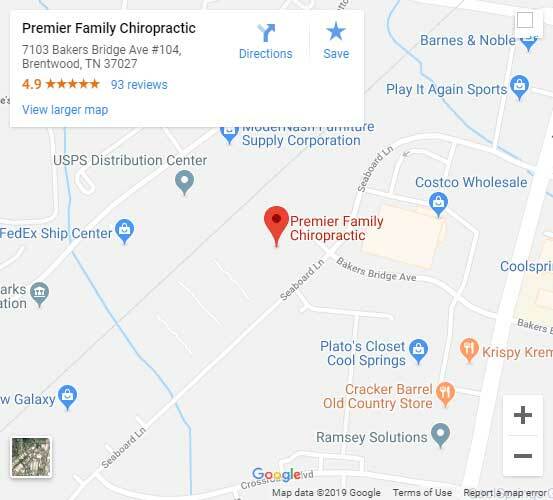 Welcome to Premier Family Chiropractic located in Brentwood, Tennessee (Cool Springs). Led by Brentwood chiropractor, Dr. Quinn W. Uzelman, we are committed to helping you optimize your health through natural, non-invasive pain relief, injury recovery, allergy relief, and weight loss. We believe that a balanced spine and strong nervous system are fundamental to health, longevity and optimal wellness. 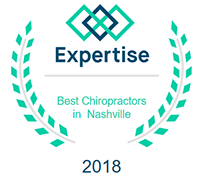 Whether you are struggling with chronic back pain and headaches, searching for natural allergy relief, or need to jump-start your weight loss, our Brentwood chiropractor is here to help.